Football is rapidly becoming one of the most followed sports for Indian audiences. It has seen a massive growth in the past few years in the country, with over 500 million viewers sampling the sport in FY 2017-18. As the audience focus shifts from a cricket-loving to a multi-sport viewing nation, the fan following for international football leagues, clubs and players is steadily on the rise in the country. This growth was further confirmed by the highly successful 2018 FIFA World Cup Russia which saw a total cumulative reach of 254 million viewers* on SPN. The UEFA Nations League has been created for the 55-member nations of UEFA, the European governing body of football. This will largely replace international friendlies in Europe. The inaugural edition of the UEFA Nations League is set to kick off this week and includes 2018 FIFA World Cup Champions France along with Croatia, Belgium, Germany, England, Spain, Portugal and more. 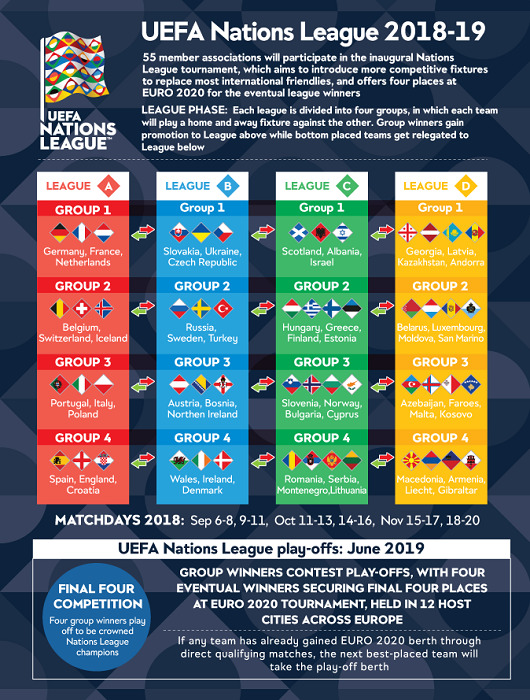 While the World Cup and the EURO championship will take place in every alternate even-year, the UEFA Nations League will take place every odd-year. 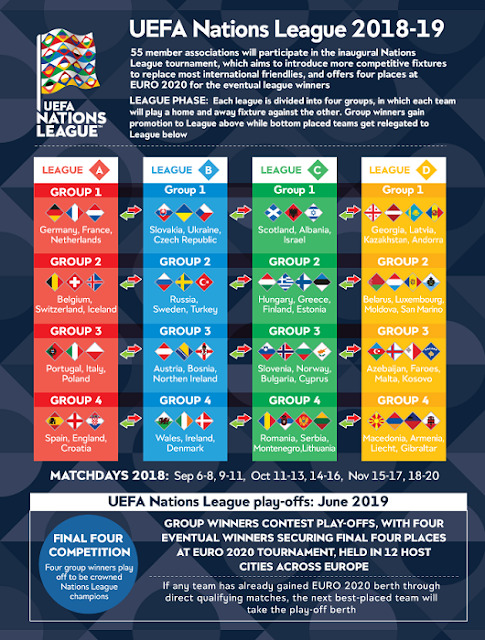 The group fixtures for the League of Nations will be played over six match days between September and November of 2018, with the finals set for June 2019. European teams dominated the 2018 FIFA World Cup in Russia and these teams will now battle again in the UEFA Nations League as we head towards the UEFA EURO 2020. The first week features France v Germany, England v Spain and Portugal v Italy. The 16th edition of UEFA EURO 2020 is going to be unique as it is not going to be hosted by one country, but rather spread out across the whole continent. 12 cities in 12 different countries will host the matches, to commemorate the 60th anniversary of the tournament. The EURO 2020 will run from 12th June – 12th July in 2020 and will feature 24 teams. Qualifiers for the tournament will run from 21st March 2019 – 31stMarch 2020. Led by Cristiano Ronaldo, Portugal won the historic championship in 2016 and will return as the defending champions. There is no better time to be a football fan in India. The new football season, which began last month, has sparked great interest. With current Ballond‘Or winner Cristiano Ronaldo moving to Juventus this season, the Serie A has already received increased viewership from fans in India. The biggest club competition in the world, the UEFA Champions League draw has also pitted the Portuguese star against his former club, Manchester United. One of the most popular clubs in the country, Barcelona is in the group of death with Tottenham Hotspur, Inter Milan and PSV. In addition to this, one of the biggest rivalries in the sporting world will resume as Real Madrid and Barcelona battle for supremacy in LaLiga. 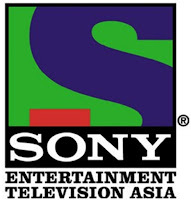 *(BARC, includes live matches, wraparound shows, highlights, repeats, surround programming of FIFA World Cup, SPN Sports Network, terrestrial network, Sony LIV). 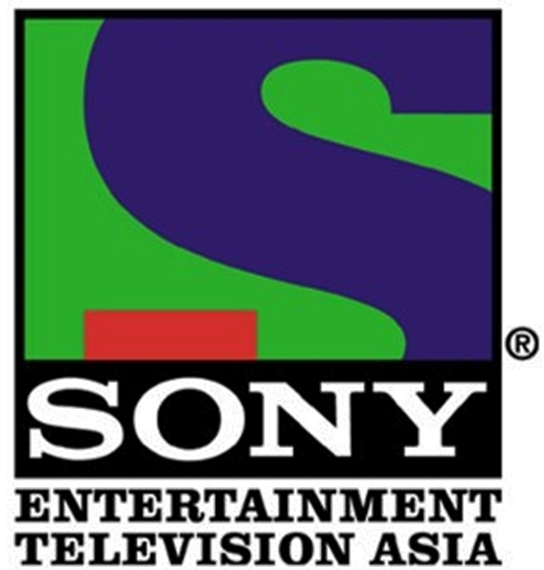 Watch the UEFA Nations League on SONY TEN 2 and SONY TEN 2 HD channels, September 6 onwards.